Board of Intermediate & Secondary Education Lahore also holds the intermediate part 1 & 2 annual exams along with matric class exams. The 11th and 12th class annual exams are held during the months of May and June every year. Written papers are held in May while practical papers for students of science group are held in June. All the colleges in the districts of Lahore, Sheikhupura, Kasur and Nankana Sahib are affiliated with Lahore Board and thousands of regular students from public and private colleges and also several private students appear in the HSSC part 1 & 2 annual exams every year. 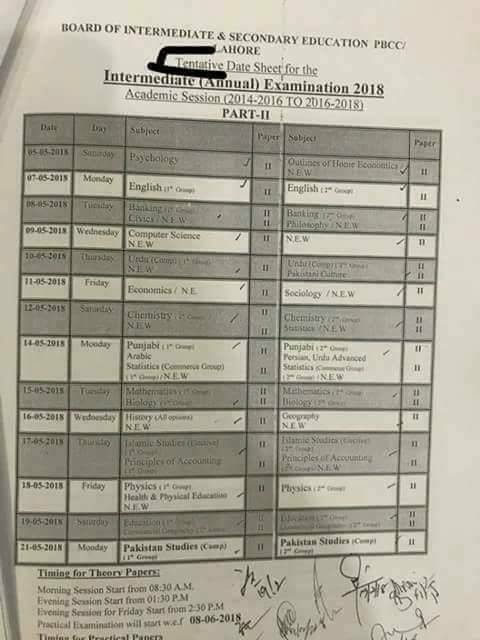 Before the start of annual exams, BISE Lahore issues the date sheet of intermediate part 1 & 2 annual exams two or three months before. Written exams date sheet is announced earlier and later practical papers date sheet is declared. These date sheets are very important as the students know about the complete time table and schedule of their 11th and 12th class exams. After knowing their date sheet, the students can easily prepare for their exams after taking in account their examination schedule as they will prepare for the initial papers in the beginning and then they will prepare for the papers scheduled to be held later.